Welcome to my journal on the creation of my first major project! In many ways, my attempt at building this game is similar to the idea that I have of the storyline - always on the edge of failure, always keeping one step ahead of death. The only way forward is forward, all that can change is the path taken. I will be posting an update at least once a week, if only to serve as a lasting record of my dedication / lack thereof. In any case, my progress will be documented here. If you'd like the project file, it's posted on every 5th update. To begin, I would like to say a few words about the concept. This is a 2d space shooter type game. Infinite maps. Go forever, to the ends of the universe - or more likely, your power supply. Shoot things. Destroy asteroids. Eliminate hostile drones. Discover an ancient war whose only legacy is the ruined starscape of past conquests and forgotten dreams. Discover false hope, death, despair, and 3 different possible endings. More features that are probably going to be exceptionally difficult to implement. A universe that stands on the verge of the abyss is all that you have left to live for - but is it also worth dying for? Click - navigate the menu, shoot weapons. Enter - create an asteroid at mouse position. I wasn't able to get the map to do anything. Is there a place I need to go to explore? Looks like a good start, though! - The map displays actors in range, with direction and scaling. That took a while to set up. - You can change controls! - You can fly around. - Lag is still a major issue. - More features I forgot about for now. 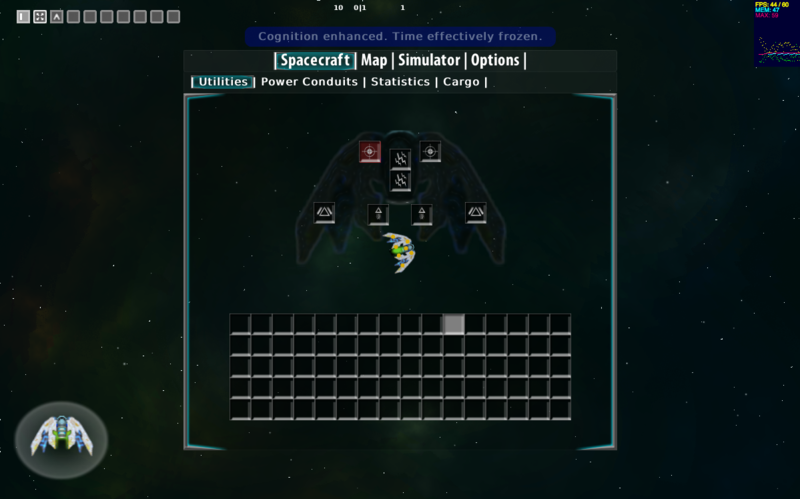 - Make the spacecraft|utilities menu actually work. Basic flight with the map open. Stress test with a few explosions. - My engine particles keep moving / fading out when paused. I'll probably need to manually change them or use a different method of creation. - Fullscreen doesn't work on web. Too bad, I don't think I'll be able to fix this anytime soon. - Movement on flash uses pixel snapping. Very annoying. Don't think I'll be able to fix this without custom code or a new version of Stencyl. 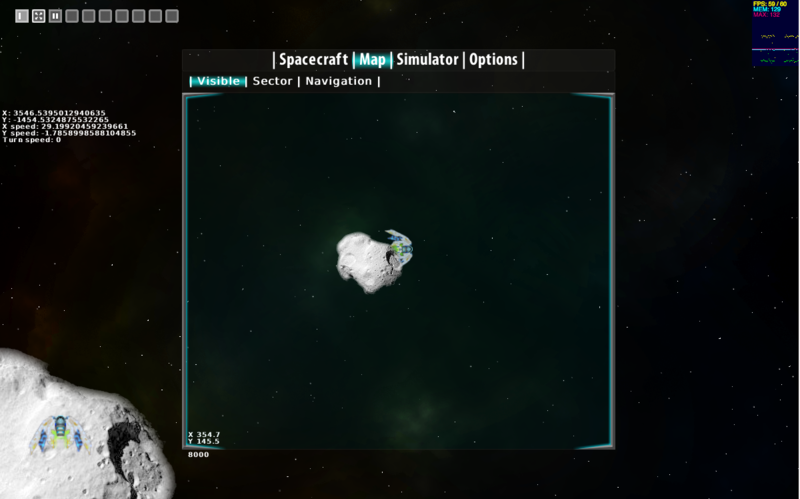 There's nothing yet, but if you click somewhere and press enter you'll create a large asteroid that you can see on the map. I suggest not to create more than 3. After that, press esc. Well, that wraps up my first update. Right now, it's been indev for about 2 weeks. Have you tried wrapping it an if block with game is paused? You could try something with it to sort this bug out maybe. - Basic features listed in previous updates. - Explosion mechanics. Explosions now work with my infinite scrolling map. - More lag. Even more lag. Trust me, it's a feature. - More incomplete features that aren't ready yet. Remember, you can always check the latest version of the game with the links provided in the first post. Stress tests on flash. Each large asteroid becomes 3 medium asteroids, which become 5 little asteroids. I wrote up an update template, so I can fill it out and have a consistent format for my updates. Always nice to have. Corrupted the game twice, had my log spammed with 20 megabytes of "Running low on free memory: 100.0"
Anyway, I'm also a little interested about the performance that I'm getting with my stars. I'm packing a whole lot of image instances into the map, and some of them aren't even rendering because I'm shrinking them too much. I'll have to tweak that around further. What else... I'm also going to need to make my own collision system, because Box2d doesn't support my custom X and Y values. Click and hold to cause the big asteroids to follow. - Particles created when using brakes (default S) still fade out. - Z-ordering of my "3d" objects is not correct. 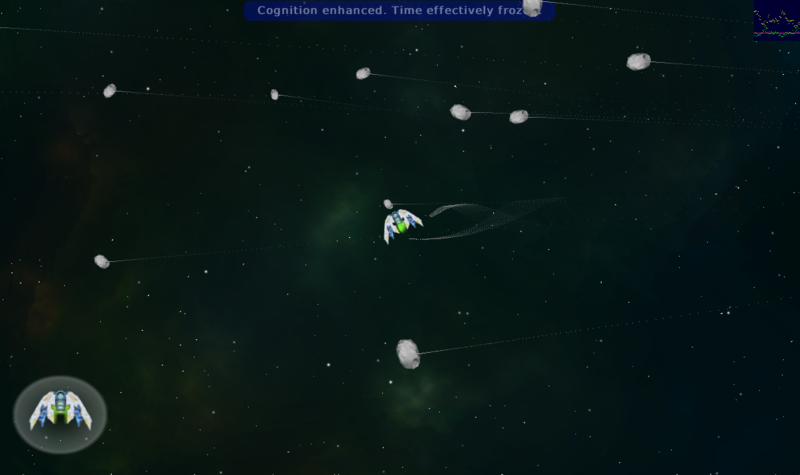 Some small asteroids still overlap larger ones, and all overlap the ship. - Probably some more bugs that I didn’t find. 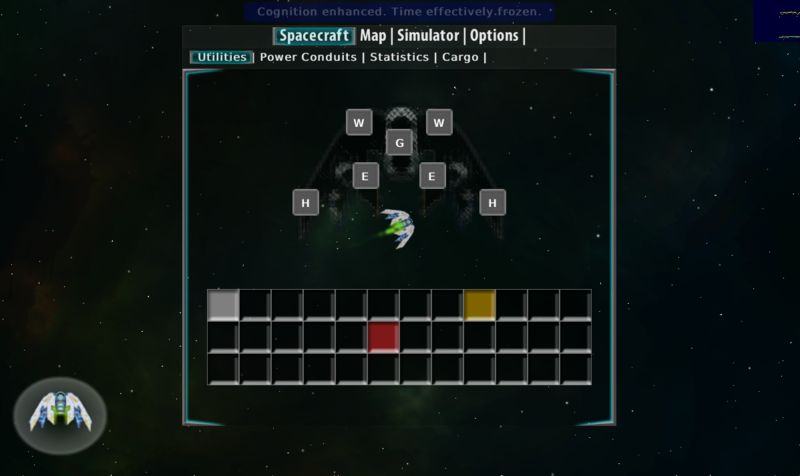 - Main engine particles no longer fade out when paused. Thanks for the suggestion, but it wouldn't work - I can't go in and edit tweens. I fixed this by making my own (very basic) custom tween. That’s basically my second update. The next update will probably be in a few days. 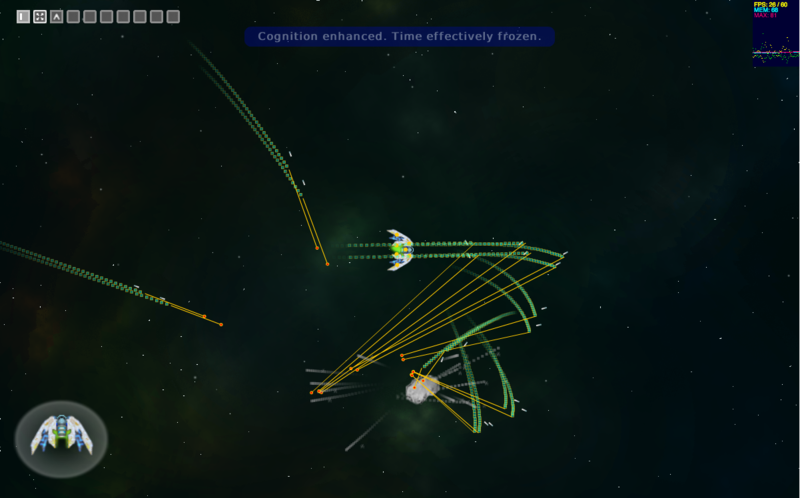 - Removed speed and position debug info. - EXTREME lag! Trust me, major feature at this point. I didn't do much today. I spent a whole lot of time trying to figure things out, though... I messed around a lot with 3d explosions, and while I did make some beautiful effects that I would absolutely love to use, they kill my computer. Less than 30 fps on cpp (mac) and Flash doesn't even want to render it. So, I didn't upload a new version today. 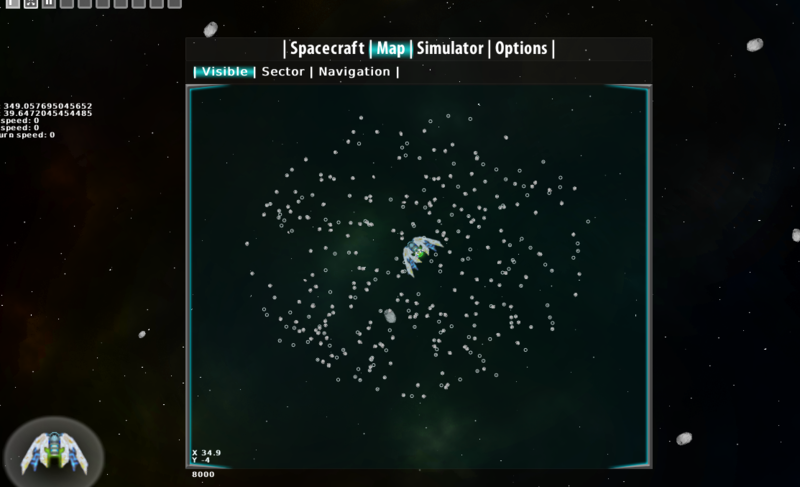 I removed collision boxes from my asteroid effects and switched their groups to effect-only groups, so they won't show up on the map. It barely helped. - Creating 3d particles makes a slight flicker. This is a quick fix, I just need to make the 3d apply to the on created switch. - Extremely laggy. 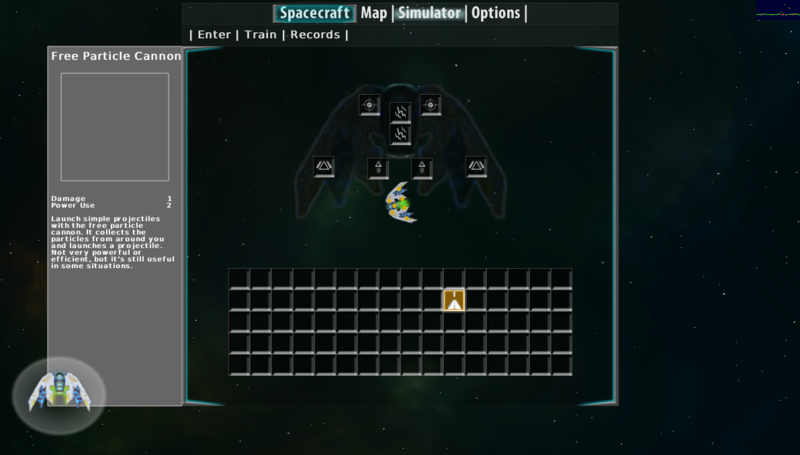 I'm sure that there's something wrong, even though I also know I'm really pushing the limits of the game with my starfield and actors. - I think I might have fixed the jittery pixel jumping in flash, but there's no way to test. - All stars now render correctly. Third update finished. More coming soon! - Even more 3d effects. - A few bugfixes of bugs that I found and removed and then forgot about. So, this is what I've been doing all day. (well, while I was working on Stencyl, anyway.) I used custom draw blocks to fill pixels (I also tested with rectangles of variable size, but that looked a bit blocky.) Great thing about this - it works in flash. I didn't get a whole lot of time to work VotA today, but I'm pretty happy with my new trail effects. They're absolutely beautiful on standalone, and I did multiple stress tests. I could make clouds that looked 3d, I could make fancy walls of dots - and still stay above super low framerates. I'm using custom draw here, so it becomes pretty resource demanding. Better than all actors, though. I also improved a bunch of other things and did fixes. Math issues resolved and all that. I tried to make a 3d sphere of dots, but I couldn't understand the math (was getting really tired) so I decided to just leave it as is and have trails follow the player. - I couldn't find any... Probably because I haven't tested long enough. - Probably some more that I didn’t find. - I fixed everything I found. That's all I know. 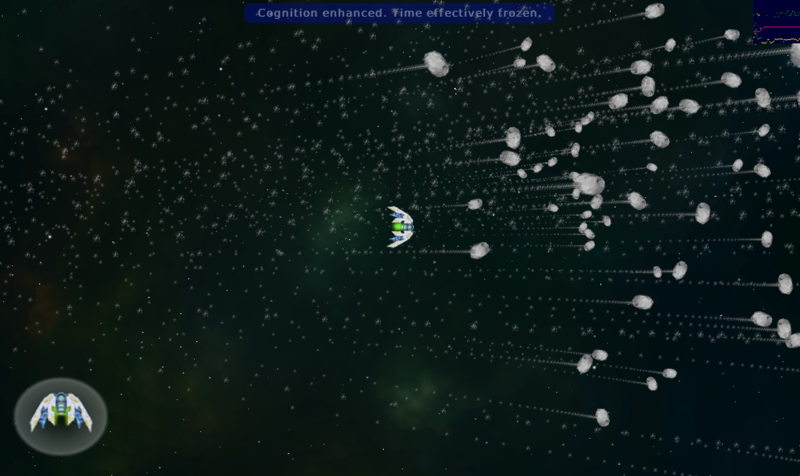 - Removed the excessive amount of particle effects. - Organized and laid the groundwork for my inventory system. This is what I've been working on for the most time today. It takes attributes from a player controller and then attaches images. And an image of having the second selector. Lots of work on my inventory system. Most of it was internal, but I did get it to read off of all the attributes (so now it can scale images to the size of my inventory icons. Still working on making it actually do stuff, but this week is really busy (relative to my definition of busy) so I have lots of other work to do. I have a plan. That's all I know. - Any bugs I didn't fix yet. - I might have fixed something. Fifth update finished. More coming soon! - A groundwork for an inventory. - Better icons for inventory system. This is a demo of my selectors actually working. 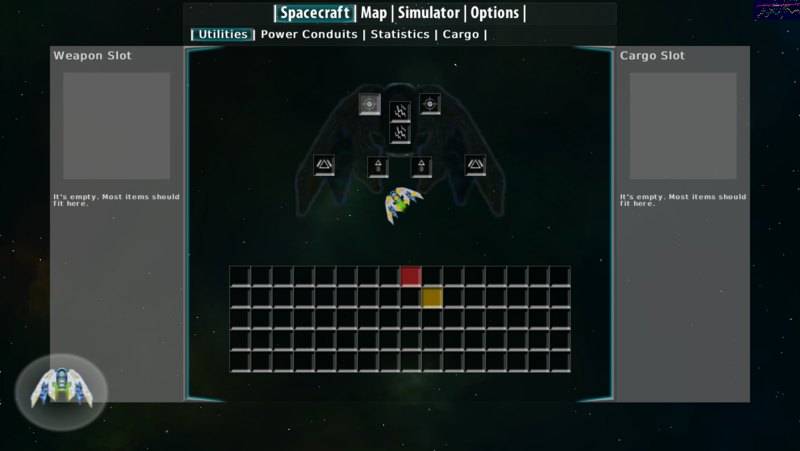 The white is primary, the red is secondary, and the yellow is cursor position. Ignore the huge amount of debug info. I did a lot, it took a long time, and I still have a heck of a lot more I need to do on the inventory system. That said, I'm really happy with what I accomplished today. Anyway, anyone wishing to learn / profit / get a good laugh from my work can download the .stencyl file (attached). Sixth update! More coming soon! As I mentioned, here's the .stencyl file for my project! Some images of the new features I added. Nothing working (yet) but I'm trying to add items that will display. I'm not sure if having the transparency will become a performance issue, so I'll need to do some tests. Getting the panels to display with draw works, but maybe I should make something else work, such as an image instance. Anyway, I'm leaving that for next time. - I made a few and fixed a few. Completed the seventh update. More coming soon! - More inventory swap functions. Extend to the equips, too. This is what I've been working on for the better part of two hours. The bugs almost won... almost. The progress is mostly from the second hour, since the first I had to delete. Even though I felt really badly stuck for the better part of the time, I actually did a lot. There's a selector, you can swap items in the inventory, and more. I'll need to work on this less for the next week. More things to do on this side of the screen and all that. - I found a whole lot and fixed them. - Fixed the way the selectors work. - Slight fixes to the inventory. A demo of my smart missiles. Their targets are marked by the red dot at the end of the yellow line. They're not perfect, but they hit stationary targets a lot more than normal guided missiles. For some reason they're very performance heavy. I spent way too long trying to figure out smart missiles. I'm still not convinced they work as well as I wanted them to. I fixed up the utilities menu, so now it has 1 item! Yes, that's right, 1! And it's a gun. By default it's equipped into the two weapon slots. If you put it anywhere else, it will do nothing. The stats are just for show. 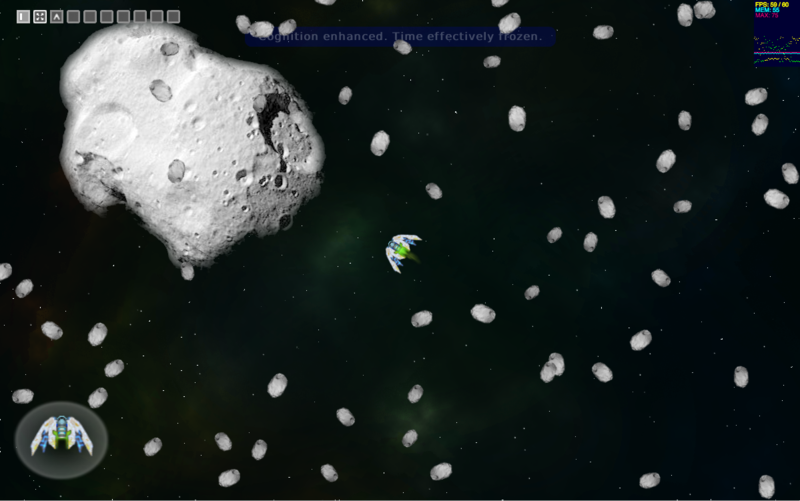 - Recycled projectiles re-appear in their death locations when being created. - Controls can be set to spacebar. - Drawing events are slightly out of sync with actor positions. - Made the inventory work properly.